Grand Canyon Trust uses non-confrontational style to help shape future of the Southwest's Colorado Plateau. 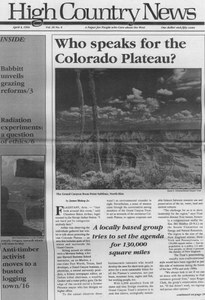 Who speaks for the Colorado Plateau? Grand Canyon Trust report shows Colorado Plateau archaeological sites being vandalized at an alarming rate. New rules may curb sightseeing flights over Grand Canyon. Mining town gives visitors a picture of the old - and the new - West. New report cites federal agencies' lack of consistency and cooperation in determining health of rangelands. Indian Water Rights: Negotiating the Future reviewed. Water rights conference focuses on Colorado's Arkansas River. Communities conference looks at changing Nevada. Land and Water Fund of the Rockies publication on takings law reviewed. Clearcut: The Tragedy of Industrial Forestry reviewed. Growing Sustainable Forest Enterprises, An Intermountain Idea Fair, will show how communities can take better advantage of logging. Energy fair scheduled in Montrose, Colorado. Western Area Power Administration plan would require utilities to use Integrated Resource Planning. HCN surveys, Linda Bacigalupi sabbatical, visitors, correction. Interior Secretary Bruce Babbitt's new proposal gives ranchers and environmentalists key roles in grazing reform. U.S. Fish and Wildlife Service won't change policy of protecting habitat despite court ruling. Forest Service proposes new guidelines for protecting grizzly bear habitat in Targhee National Forest. Ocean waters off Washington, Oregon and California coasts off limits for salmon fishing. Clent Bailey crusades to end needless deaths of raptors on old power poles. Art Kunstwaffen Art Group commemorates cow art with video. Challis, Idaho, rancher didn't tell whole story about living off the land. Wyoming jackalopes cause confusion overseas. Massacre of 1861 in Almo, Idaho, never happened, historian says. Controversy continues to surround Dr. C. Alvin Paulsen's experiments on Washington State Penitentiary inmates. Population of trumpeter swans in Yellowstone National Park down due to competition from other birds. Oregon writer muses on how Andy Kerr will fit into his new community.